Produced, mixed & edited for Non Stop Jamming Productions. Great 12" both tracks and all mixes are really strong. Industrial Bass - bass driven track that drivers relentlessly throughout the track, with Hallelujah vocal sample, and aaahhhh chant weaving in and out of the track. Total Recall is a more house sound and happy laid back feel to it, with a lovely warm sounding synth rift, that changes in and out the track to great effect. Both tracks well worth a listen. Amazing killer tune that is Industrial Bass (Industrial Mix). Raw track from 1990 with a bassline that drives concrete to butter, fine NY house, Licensed from Nu-Groove Records. what a brilliant track! 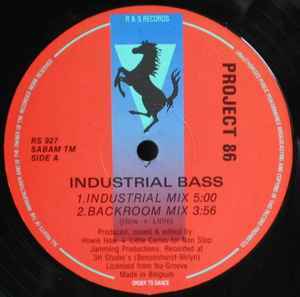 techno at it's best in industrial bass! don't make them like this anymore.